When Richard became King upon the death of his grandfather Edward III, England was already a mess. The seemingly ever present war in France was not going well, and England was broke. His royal Highness imposed a poll tax upon his subjects to raise funds.This tax inspired the Peasant’s Revolt of 1381 led by Wat Tyler. The young King met the rebels at Smithfield, had Tyler killed and quelled the rebellion by promising his subjects he’d meet some of their demands, and then immediately reneged. Sike! Richard wasn’t any more popular with the nobility. He was a very firm believer in the divine right of kings. After he had married Anne of Bohemia, the daughter of Charles IV the Holy Roman Emperor, he attempted to blow off his regency and take on the full reins of power himself but Parliament wasn’t having it. The young king decided to show Parliament who was boss by appointing Michael de la Pole as his chancellor, and his other uncles Dukes of York and Gloucester to knock his Uncle Lancaster down a few pegs. He did all this, naturally, without consulting Parliament. Richard surrounded himself with a small group of his favorites. They were at complete loggerheads with the older nobility – where the old school aristocrats like the Duke of Buckingham were in favor of a direct attack on (you guessed it) France; those close to the king believed negotiations were a better strategy. By this point, everyone was sick of hearing about Richard’s Royal Prerogative. The Old Guard broke up his inner circle, killing many of them while the ones that could escape ran for their lives. Over the years, the King tried to regain the goodwill of the barons. His second marriage to the daughter of the King of France and his order to execute the Dukes of Gloucester, Arundel, and Warwick made that impossible. By the turn of the century, Richard had managed to alienate everyone from the highest noble to the lowest peasant. In February 1399, Richard denied the exiled Henry Bolingbroke his inheritance on the death of his father, The Duke of Lancaster (John of Gaunt.) Two months later, while the king was in Ireland, Henry Bolingbroke raised an army and invaded England. 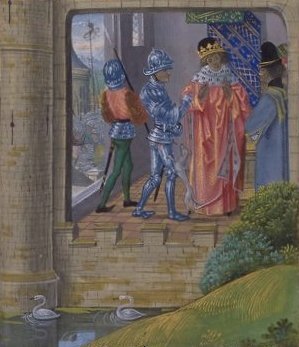 When Richard returned, he hid in Wales for several months, finally surrendering to Henry on August 19, 1399, agreeing to abdicate in exchange for his life. Henry, who was already acting as king and considered his cousin’s abdication a done deal in any case, imprisoned the deposed monarch at Pontefract Castle, where he died, most likely in early 1400.